extent applicable. Consequently, results for the quarter ended 31st December 2015 have been restated to comply with Ind-AS to make them comparable. in exports during the quarter ended 31st December 2016 as compared to corresponding quarter last year. However, dumping of stainless steel products in India, especially from China, is putting pressure on the Indian stainless steel industry. 3. Present quarter witnessed an increase in the gross income from operations by 22% to Rs. 1,979 Crore from Rs. 1,623 Crore in the corresponding quarter last year due to increase in volume & prices. 1 The EBITDA margin during the quarter was at 12.6% as against 11.6% in corresponding quarter last year and EBITDA margin during the nine month of FY 2016-17 has improved to 14.2% as compared to 12% in corresponding period last year, which is primarily due to overall improvement in operating efficiency and change in products mix. 4. During the quarter ended 31st December 2016, net profit at Rs. 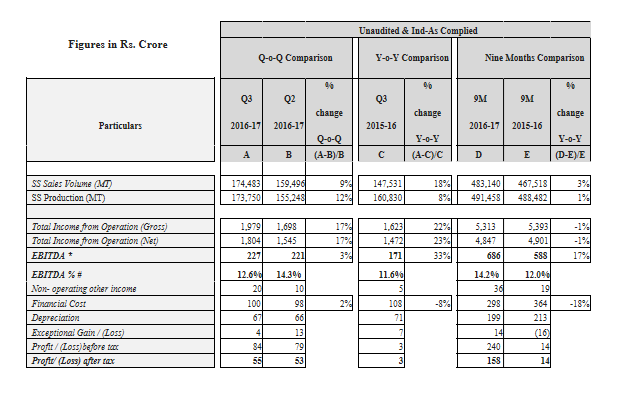 55 Crore as against Rs.3 Crore in corresponding quarter last year. The net profit during first nine months of FY 2016-17 is Rs. 158 Crore as compared to Rs. 14 Crore in corresponding period of FY 2015-16, primarily due to increased EBITDA, reduction in interest cost and increase in exceptional gain. Global economic growth is expected to pick up as business sentiments appear to be on revival mode. According to International Monetary Fund (IMF), global economic growth is likely to accelerate in 2017-18. IMF forecasts a conservative recovery for the world economy primarily on the growth projections in both emerging markets and developing economies. However, given the unpredictability in policy stance by the new US government, global trade sentiments may be affected. The global stainless steel melt shop production rose to 45.71 Million Tonnes in 2016 registering a surge of 8.30% from 2015. Encouraging global economic indicators show stainless steel demand to pick up and is expected to increase by 4.16% in 2017, as per Steel & Metals Market Research. Indian economy is likely to continue to grow at a pace of over 7% which would drive the demand for stainless steel. Augmented expenditure proposed for the year 2017 on infrastructure sector by the government will be the key driver of stainless steel demand including railways.